Cathy's Card Spot: Dreamcatcher on blue. Hi everyone, I hope you had a relaxing Mother's Day if you were celebrating it. I had a lovely day just pottering around, even had a nanna nap! A friend asked me to make a birthday card with feathers on it, so I'm hoping she likes dreamcatchers. 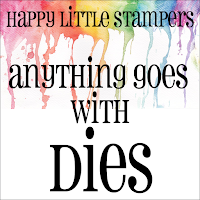 I borrowed this Cheery Lynn die from my sister ages ago and thought I'd better use it before she wants it back! I enlarged the lacy circle with a border diecut from 2 Spellbinders dies. It made the image just that bit bigger which is what I wanted. I used distress inks to colour the white feathers and also to give a bluish tinge to the silver diecuts. The background is painted with Kuretake Gansai watercolor paints in a few shades of blue, with a touch of Finetec silver watercolour paint for shimmer. 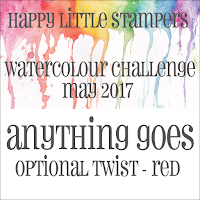 At Happy Little Stampers watercolour, I'm choosing the anything goes option. 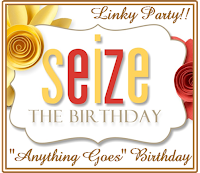 I'm also adding another entry to Seize the Birthday, going with the no toppings option this time. Supplies: Kuretake Gansai and Finetec watercolour paints; Cheery Lynn dreamcatcher die; distress inks; silver card; sentiment sticker. Beautiful dream catcher. I have a couple of feather stamps and never really known what to do with them. I do now! Hugs Mrs A. Your background is beautiful with that touch of silver. The dream catcher die is really authentic and adding a circle over it was very ingenius to make it bigger. The feathers look so real...the dream catcher looks perfect. Cathy, this is GORGEOUS!!! Love it! Super dreamcatcher and I love the watercolour background. would look personalized. the same like that online. 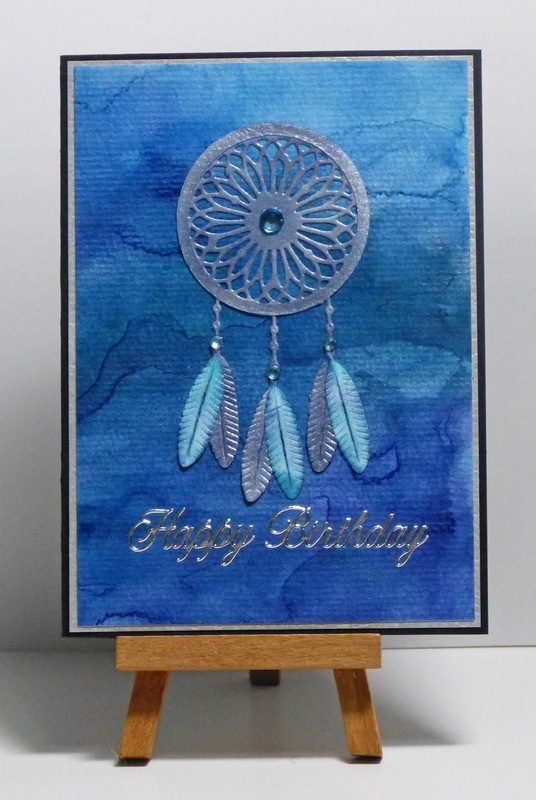 Awesome card - the blue bg is perfect with your dream catcher. Thanks for joining in at STB. I love this...dreamy blues and a great die that looks wonderful on that bkg. This is lovely Cathy! Your background is stunning! So happy to have you as our guest at STB! So pretty, with that dreamy background! Amazing card! Background that you created looks like the sea depths, or how my dreams :-) Great!